Partick Thistle manager Alan Archibald has lost two more players after Paul Gallacher and Gary Miller became the latest squad members to quit Firhill. Veteran goalkeeper and coach Gallacher and right-back Miller both rejected the offer of fresh contracts. It comes just a day after Belgian defender Freddy Frans also announced he would be moving on from the Maryhill side, while midfielder Stuart Bannigan has turned down an offer to remain with Thistle. Miller, 29 – who previously played for Ross County and St Johnstone – signed for Partick last season and played 24 times. Gallacher, 36, made 40 appearances during his two-year stay at Firhill. He is expected to join Hearts as a goalkeeping coach/back-up keeper. Partick said in a statement: “The club can confirm that Frederic Frans, Paul Gallacher and Gary Miller have turned down new deals and will be playing their football away from Firhill in the 2016/17 campaign. There was good news for Archibald, though, with David Wilson following the lead of midfield colleagues Abdul Osman and Stevie Lawless by committing himself to the club for another 12 months. 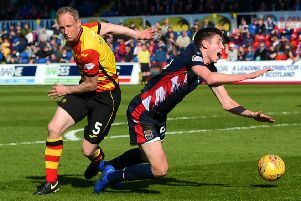 The 21-year-old made his debut for Thistle back in January 2014 as a late substitute against Celtic and has since gone on to feature 19 times for Archibald’s side.